I was a year ago exactly that Hartley Wess completed Ironman Florida at 70 years young. In January this year H contacted me with another event that he wanted to tick off. Hartley grew up in NYC and it was the hometown marathon that had his interest. After some downtime post Ironman last year and well into 2018 I got the message that he was ready to get going however while playing softball he had torn his hamstring. 'Can we still do it coach?' Lets see was the answer. Starting back gradually we built running into the program and made good use of swimming and riding to build fitness and have less impact on recovery. Fast forward to last Sunday and Hartley crossed the finishing line. Post race he commented 'Up until this point WA IM was my favourite race but this was just awesome.They said that 2 1/2 million people lined the course to cheer.I don’t know about that but there were a bunch!!!! Felt good throughout, took my time to just enjoy'. Down in the Southern Hemisphere we had the boys racing up in Noosa. 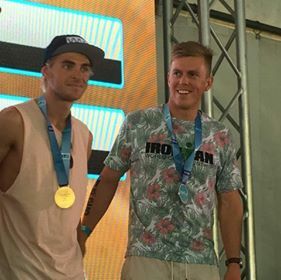 MEC coach Andy White led the charge and while he has had a different focus when compared to coming off Kona and winning his A/G in Noosa last year, he certainly showed he has been keeping well, bringing home 2nd place in the 25-29. Pete Smith had been teeing up Noosa for the back end of the year with a shorter distance focus but a hamstring injury from baseball slowed things down leading in to this years event. Nevertheless he took to the start line with the body on the improve and put together a worthy race all things taken into account. Back to form now as the Australian season kicks off. Angelo Bonacci is on the comeback and Noosa was the perfect place to build some motivation. Certainly not caring the fitness he has in recent years however a well needed break will have him in good stead long term to tackle what he is after. There is nothing like a boost to the motivation for a competitive athlete than being a little unfit at a race. We look to now build gradually into the season with Ang. I have been with Michael since Nov 2014 and have found him to be a great coach and a great mate. He puts his athletes first and is always very informative of the short term and long term goals. My swimming has improved from 56min down to 37min for 1.9km. He keeps things simple and I'm looking forward to the journey that lays ahead with Momentum Endurance Coaching.